The Big Band of the SWR radio station in Stuttgart celebrated its 50th Anniversary in 2001 by releasing this 2-CD package, recorded over five decades under the leadership of Erwin Lehn. 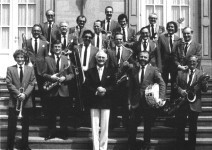 A great number of German and American jazz musicians worked with this band. For several years Ack van Rooyen, Rolf Ericson, Bob Burgess, among others, were regular members. The albums are superbly played, recorded and packaged, and are a collector's item. The package can be ordered directly from the link above and costs €30. Several gems are to be found here, among them the Kai Winding and Ack van Rooyen solos on Monobone; Frank Rosolino on Caravan, and the late, great Bobby Burgess on MacArthur Park. Bob had asked me to score this as near as dammit to the Woody Herman version, where he had previously recorded this solo, so I did. You can hear his particular style of staccato phrasing on this, while his influence over the whole band can be felt throughout the score. The production of this superb package, with its conception and realisation, was carried out by Rudi Reindl and Karl Farrent, both of whom play trumpet in the present band. Special thanks to Professor Erwin Lehn.